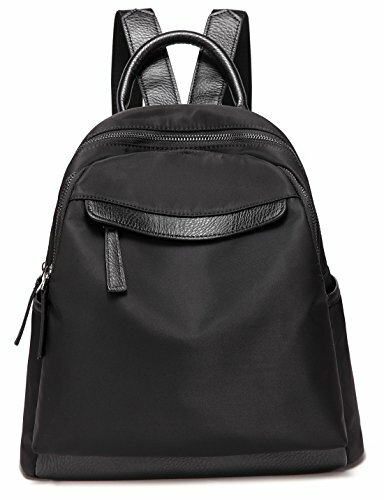 This is a medium-size backpack, simple and stylish design, but also has good practicality. It is perfect for everyday short trips.It can also be a good schoolbag for kids. It can hold your wallet, cellphone, makeup bag, tablet, umbrella and some books. High-density nylon material, with good waterproof function. We provide a variety of colors for your choice, there is always a will be for you. TINGLAN is a company focused on the design and sale of high quality bags. We will be responsible for every product sold out. If you have any questions or comments, please contact us.You will make us better. Due to manual measuring,there may be a little deviation for items. Please allow little color difference due to camera or light environment. 【Dimensions】: Small-Size 12.2"x5.5"x12.2"(L*W*H),net weight about 1.43lb; Shoulder length adjustment range from 23.2inch to 37.4inch.Suitable for most people. 【Main Material】: This backpack is made of high density nylon and has a good waterproof function. It can ensure that the contents of the bag will not get wet in the rainy day. Shoulder straps and handles are made of high quality PU leather. And we have reinforced it to make it more durable. 【Exterior】: 2 pockets on side of the backpack, it can hold a water bottle. 2 zip pocket at the front of the backpack, 1 zip pocket in the back of the backpack. 【Interior】: pocket small pocket*2, zipper pocket*2. 【Function and Features】: Small-Size,It can accommodate a 9.7-inch tablet,easily hold your wallet, cell phone, makeup bag and umbrella and so on. Looks very simple and stylish.Perfect for everyday travel, shopping and travel. If you have any questions about this product by TINGLAN, contact us by completing and submitting the form below. If you are looking for a specif part number, please include it with your message.